It never occurred to me that I could find Jesus at home. Not the flesh and blood but the spirit. My physical sense of longing has been active for years, searching in churches and temples, sacred spaces, parks, oceans and rivers for the God I loved and the God I let go of. There have been days I have found Him deeper in the waves of the ocean than on my knees in a church. In the rough terrain of spiritual travel, the inner divine sometimes gets caught up with the worldview of spirituality. With so many different ways to celebrate God, I have often become mired in the rules and opinions of others. The beauty of humans is their willingness to go to any length to find comfort in the seat of God’s lap, but the darkness creeps up in the judgment of where that lap is. God will always be God regardless of our thoughts or opinions. But the way we relate to God is similar to the way we relate to the world; a blade of grass that speaks to me may mean nothing to you while the sound of the highway may mean everything. I have been bed bound for several days now and the kids and husband are away. Though the pain has been great, the clarity has been far-reaching. The depths of my heart have been crying out for a spiritual retreat, a time of silence, a time away. And although I have silently prayed for these things, almost an unconscious prayer if you will, I always thought it a bit selfish to ask God for a spiritual getaway. In any event, it would never happen. I have a job and three children, a husband and a full plate; that is until I was forced into bed by something I could not control. So when the family left for the weekend I was in pain and alone. It’s been ten years or so since the last time I ever remember being alone like this. Smack dab in the middle to end of Lent I found myself here, in a desert I prayed for but never saw coming. My first thought was to reluctantly give my pain up for someone who didn’t deserve it, my least favorite person, someone who had persecuted myself and many around me. I asked God to accept my pain as a sacrifice for this man’s salvation, his reconciliation with God and a second chance at mercy. Heading into day two, the silence seemed uncomfortable. But I noticed the sunlight coming off the kitchen window, the beautiful color of the dark wood stairs and the sound of the highway that reminded me I was not far from the chaos of the world. I wanted to create a sacred space, get on my knees on a kneeler to Mary, look at an iconic picture and find myself surrounded by darkness and candlelight. But from a bed this was impossible, so I started to research retreats at home and found nothing. So I turned back to Jesus and his methodology and the idea of spiritual retreat. Many of us find ourselves in these situations. Hectic schedules, health problems, the inability to travel due to time or money constraints. We want bigger houses, bigger jobs and bigger lives. ← Are We Connecting On The Same Level? In the Eastern Tradition, much as Jesus told his disciples, we set aside a small room (or part of a room) for prayer and meditation. An area that can be close off from the rest of the home to attain quiet. For my grandparents it was a walk-in closet that they converted. For my parents it was part of their bedroom. For me, it is a section of our patio room. 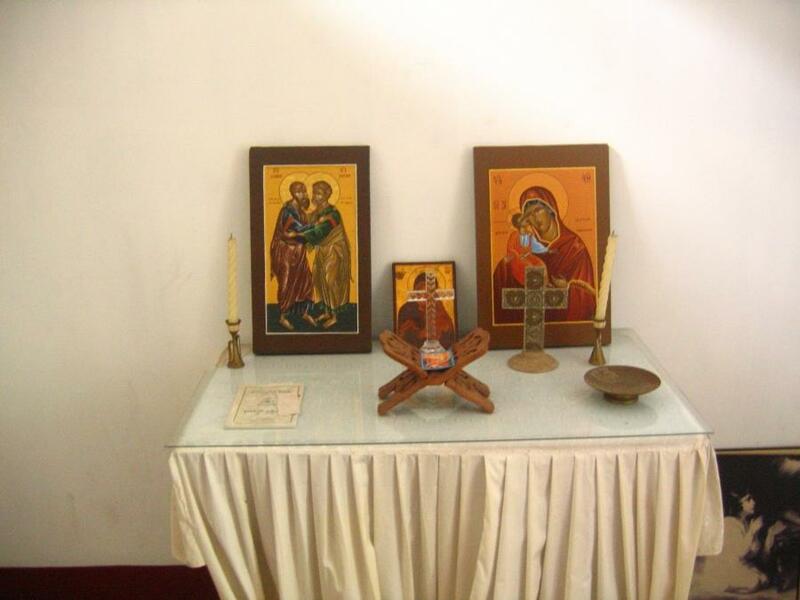 It is considered an essential part of an Eastern home and prayer life. This is what I was thinking of doing in my new home. I have to find that sacred space. I have a place on the patio I am looking to make a meditation area dedicated to the sacred heart of Jesus and Mary. The important thing is that you can be in there without the noises and interruptions of family, friends, and (ahem) phones. 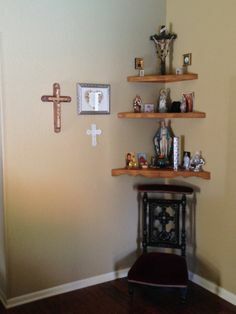 My grandparents was simple, only a chair, bible, and icon to aid in meditation. I’d love to see some pictures! Examples etc. I am such a visual person! Here are some simple examples from the net. For an Eastern prayer room it would be arranged so that the person is facing east (rising sun), even if everything was arranged in a corner instead of a wall. Just remember that the goal is simplicity. The objects are not there to pray to, but to act a a guide to direct your prayer towards God. Same with the books and the Bible, they are to help you select a direction for your prayer and meditation. Yes exactly. I find that these things really assist me in prayer and meditation. 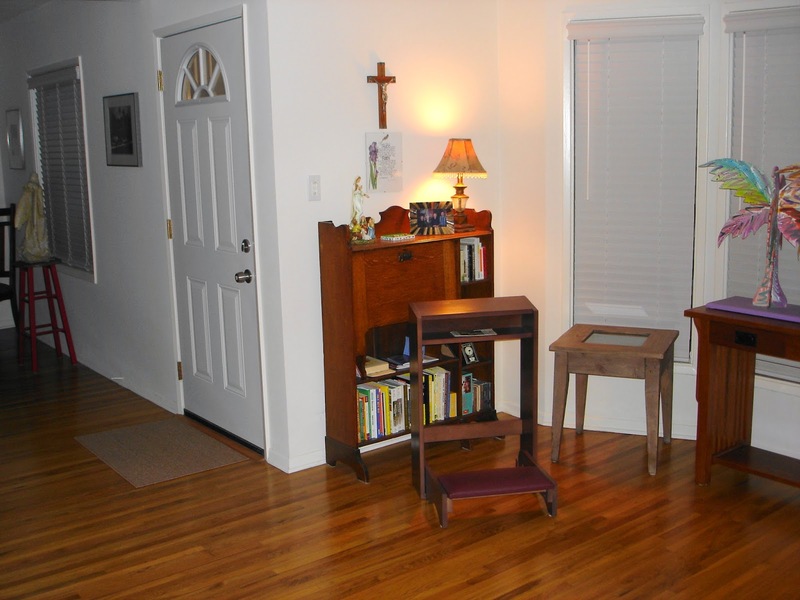 I have small corner now but it is in a high traffic area of my house so it is not conducive to prayer and meditation. That’s so weird the link just disappeared, can you re-send it? I still see the links, perhaps refresh your browser. Yes now I see it, thank you! Have you ever been in a conversation around you and not heard a word? “Zoning out” others tell me when I ask what i have missed. Silence is everywhere I think. Except we don’t want to miss anything (!) so we let in everything – and then struggle to find silence. I am finding that the more I find “silence” among others the less I need a retreat or a discipline. And – in case that sounds like ignoring others – even arrogant(!) – I “hear” Him is a sensory way not just a verbal way. So I can hear others speak and still “hear” him at the same time more and more.